I’ll deal with the high-speed metro proposal in a future article but for now I’ll concentrate on the Sydney city end of the route. The decision on CBD station location will have major implications for the CBD’s future development, centralising rail access in the city’s centre. Media reports suggesting that Martin Place has been selected as the primary (and potentially only) Metro West CBD station are not so surprising. As I noted in my previous article, the existing stations at Martin Place and Central will be the Sydney Metro Northwest’s only two CBD interchanges with the existing rail network when it is extended through the city as the Metro City and Southwest. Given Central is well south of the proposed Sydney Metro West alignment, the only realistic option for a single city interchange with the other metro line and the existing rail system is Martin Place. While no indication has been provided regarding the specific location of the Metro West station, it is likely to make use of the concourse and entrances planned for the metro station currently under construction (located in the block bounded by Castlereagh, Hunter and Elizabeth Streets and Martin Place). There are several options. The first would be for the Metro West station platforms to cross the planned Metro City and Southwest platforms at a right angle roughly parallel to and just north of the Eastern Suburbs Railway (ESR), but below rather than above the metro. This would provide direct access between the two sets of metro platforms and to the concourse, as well as making it easier for the Metro West corridor to clear the ESR and the City Circle tunnels to the west of Martin Place. Given that Zetland and Malabar have been suggested as options for the south eastern terminus for a future extension of Metro West (more on this in a moment), another possibility would be for the line to start turning south before it reaches Martin Place. In this scenario the station platforms would run roughly parallel to and under the Metro City and Southwest (see diagram). The media reports also suggest that an “unpaid concourse” would be built underground eastwards to connect the Martin Place interchange to Wynyard station. This would give travellers on both metro lines an opportunity to change to services on the City Circle, as well as the Western and North Shore lines; it’s worth noting however that the pedestrian tunnel between the two stations would be about 400 metres long. The pedestrian link clearly rules out any suggestion that Wynyard station could provide a second Metro West interchange as this would an expensive pedestrian tunnel redundant. By implication the tunnel proposal also likely rules out a second stand-alone Metro West station on the western edge of the CBD. As Martin Place is close enough to the CBD’s eastern edge to make another stop there improbable (though not impossible as we’ll see in a moment), it is likely to be the sole station on the Metro West line within the current confines of the city centre. This contrasts with the metro line currently under construction, which will have four CBD metro stations, or the existing rail network where each line has between three and six CBD stops. These lines however mostly run down the city centre’s three-kilometre long-north south axis for all or part of their route, while Metro West crosses the CBD on a much shorter one-kilometre east-west alignment. If there is only one CBD option, Metro West passengers travelling to the city would either have to exit at Martin Place or change trains there to reach another CBD destination via the other metro line, the ESR or the proposed pedestrian tunnel to Wynyard. 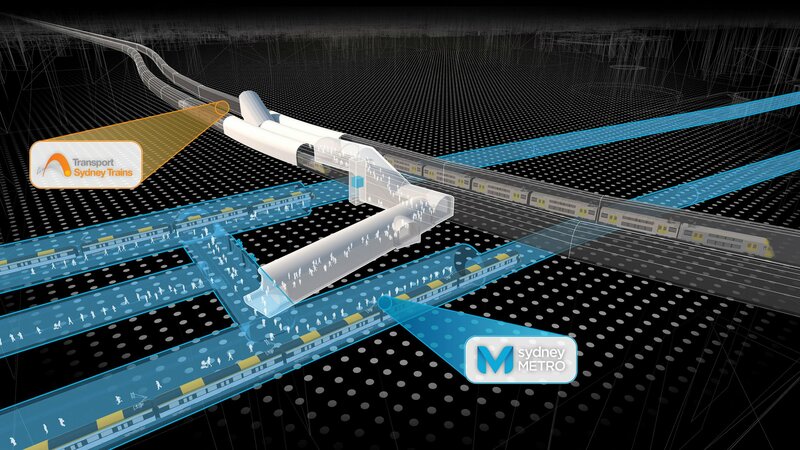 In theory they could also use this tunnel to access City Circle trains to destinations near other city stations such as Circular Quay or Museum, given the distance involved this is unlikely. In addition, Martin Place would be the only option for Metro West passengers wanting to interchange in the CBD to access stations outside the city centre on the other metro line or the existing rail network, either via the ESR or by taking the long walk to Wynyard station. Making Martin Place such a critical interchange station clearly reinforces its role as the “new” Central, one which unlike the actual Central Station really is located in the heart of the city – or at least its financial district. This means that Martin Place is likely to have high passenger numbers, especially if its interchange role attracts further commercial development nearby. How this will impact on the very high peak hour passenger volumes at Town Hall station is still unclear. In an earlier article on locations and catchments for the Metro City and Southwest stations I noted that Baranagaroo would be the only station on the line to add significantly to overall rail catchments in the CBD (see diagram), as opposed to just increasing capacity. Obviously if the Metro West’s sole CBD station is integrated with the existing Martin Place station it will also not expand the CBD-wide rail catchment in any way. This does however leave open the possibility of metro stations just beyond the edges of the current city centre, supporting either an expansion of the CBD, additional residential development or both. To the west the obvious option is Pyrmont, where early geotechnical investigations recently took place in Edward Street. Of course, these investigations do not necessarily indicate potential station locations, but they do strongly suggest the government’s preferred corridor for the overall route. I will discuss station locations in more detail in my next article in this series but a station at Edward Street would service the casino, Sydney Lyric Theatre and the maritime museum, as well as being a catalyst to extend the envelope of the CBD further into Pyrmont (though this could attract local opposition). It would also provide an interchange with the Inner West Light Rail line, providing a convenient short-cut for light rail passengers wishing to travel to the centre of the CBD rather than to Central Station. On the eastern side of Martin Place things get interesting. 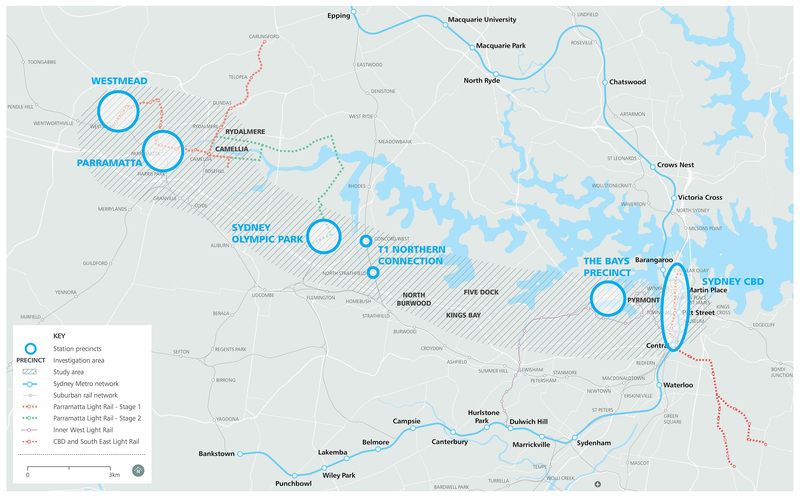 While the Sydney Metro West documentation states only that the government will “safeguard the ability to extend the metro” to the south-east via Zetland, thereby “serving the Green Square town centre”, the reality is that the tunnelling for the first stage to Martin Place is likely to make a start on any such extension. This is because of the large entrances or dives required to install the massive tunnel boring machines (TBMs) at the beginning of the tunnelling process and to retrieve them at the end. Obviously, it is extremely difficult to excavate such dives within the CBD; if the TBMs are coming from the west they will likely continue past Martin Place station and some distance out of the CBD until there is a suitable dive location to extricate them. If a near-CBD station is contemplated it may therefore be built in this stretch as part of the initial stage of Metro West. Defries Avenue in Zetland, which about 4.5 kilometres due almost directly south of Martin Place, has so far been the site of the only geotechnical investigation for the Metro West line southeast of the CBD. While the same caveats apply as to the Pyrmont investigation site, a station here is more likely because of the commitment to support the Green Square town centre. The most direct route to Zetland passes tantalisingly close to both St James and Museum stations. These are the least-patronised of the existing CBD rail stations; a Metro West interchange station linking to either would help to spread passenger loads around the City Circle but is very unlikely. Museum station is just sufficiently far enough away from Martin Place (1 km) but its traditional layout would be difficult to integrate with a metro station. On the other hand, St James’s wide central platform would make it a much better candidate for an interchange with a metro line running just underneath, but it is less than 400 metres from Martin Place. A more feasible option would be for the metro line to run slightly further east of the most direct corridor. This would provide the potential for station in Surry Hills, for example close to the CBD and Southeast Light Rail (CSELR) light rail stop under construction at the intersection of Devonshire and Riley Streets. As well as adding a potential interchange to the light rail, a station here would also help to extend the CBD envelope – though again there could be local opposition to this. Moving the line still further east leads to the opportunity for a station near Moore Park Road, which would service the southern side of Paddington and the northern end of the Moore Park sporting complex. Unlike the Surry Hills option the catchment for a station here would not overlap the existing CBD catchments, but the tunnel would need to cross the Eastern Distributor road tunnel. To a significant extent the decision on whether and where to provide additional stations on the periphery of the CBD will depend on the government’s decision on the trade-off between speed and station numbers on the Metro West, which I’ll discuss in the next article in this series. This entry was posted in Infrastructure, Public Transport, Sydney metro area, Transport and tagged Infrastructure, metro, Rail, State Government, Sydney metro area, Transport. Bookmark the permalink. 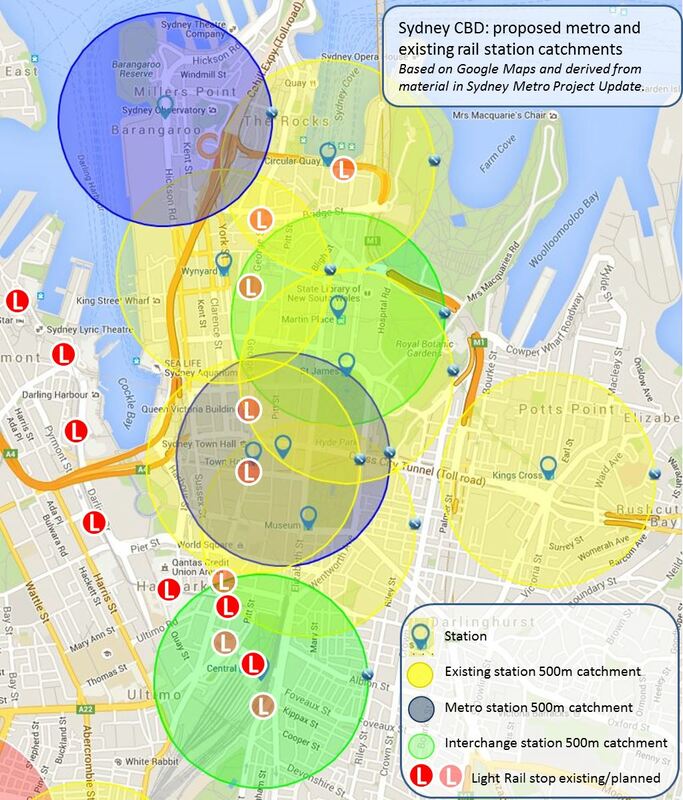 2 Responses to Martin Place – the “new” Sydney Central?